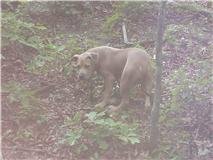 In August of 2011 we saw online where a beautiful stray dog was given the grace to wander into the woods behind the home of none other than volunteers of Angels Among Us Pet Rescue. We were drawn to this angel right away, even though he was not up for adoption yet, we had to meet him after hearing of his rescue. 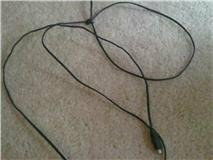 He had appeared in the woods dragging a cellphone cord tight around his neck. He was hot, thirsty, scared, and not yet trusting of people. The amazing volunteer family spent a very long time coaxing him to come to them so that they could cut the cord off his neck and get him inside where it was cool. They provided him with food and water and became his foster parents. We emailed Angels Among Us asking to see this poor guy, and his Foster Mom was great. We met at Suwanee Park and he was very nervous, and despite the chicken I brought with me he would not look at us or take the treat. We tried to walk him and it was not easy as he watched his Foster Mom very closely. (This was obviously not a normal situation, but love grows in some of the saddest places and we were going to fall hard!) We needed time to think on this though, having another dog already and never having rescued a dog displaying such fear. Angels Among Us was great, and the Foster Mom met with us several more times so that Bentley could get used to us. He never once showed any aggression even when scared. He had his shots and was neutered, and with an E-collar still on came to see us again and this time the Foster Mom left him with us alone where we could walk him so he had to focus on us. That was when we got our fist tail wag and even a kiss, and yep that sealed the deal, he was ours forever! We knew he had fear issues but thought with time he would get better, but we had no idea how deep that fear ran. The first time that we brought him home it was hard to even get him out of the car. As the days and weeks went by, we realized we had some issues. He was afraid to walk our neighborhood without our other dog with him, and almost everything frightened him...bikes, joggers, garbage cans, balloons on a mailbox, and cars and trucks could cause him to stop, drop to the ground and shake, or try to flee in the opposite direction. It was heartbreaking to see. However, he did love dogs! So we took him to doggy daycare to help. Each time (for almost 2 years) he would crawl into the lobby and just want to get in the room with the other dogs, and when he did he was the life of the party, a totally different dog. The employees there had trouble at first getting him out when we picked him up! But this was a good first step. Then soon, although scared, he would walk on his own, but always ran from the leash and never actually wanted to go for a walk. We had never seen this! He got to a certain point of doing what he had to but in fear, and we were starting to adapt by avoiding lots of normal things that would scare him. Two years went by and we were surprised he had not grown out of the fear; something had to change. We did a consult with a trainer, watched the DVDs, got advice online, but it never really helped much. Our vet told us about Angie Woods at U.S. Canine, and after much thought, we knew we owed it to Bentley to take this journey with her. We had a thorough phone consultation and filled out a questionnaire online so she would understand all of his issues and environment. It was decided he would need the two week immersion program. Now I was nervous, as I am sure many pet owners are hearing this, but when we pulled up to the beautiful, peaceful environment of U.S. Canine, I started to feel better, and even more so after meeting Angie and her staff. 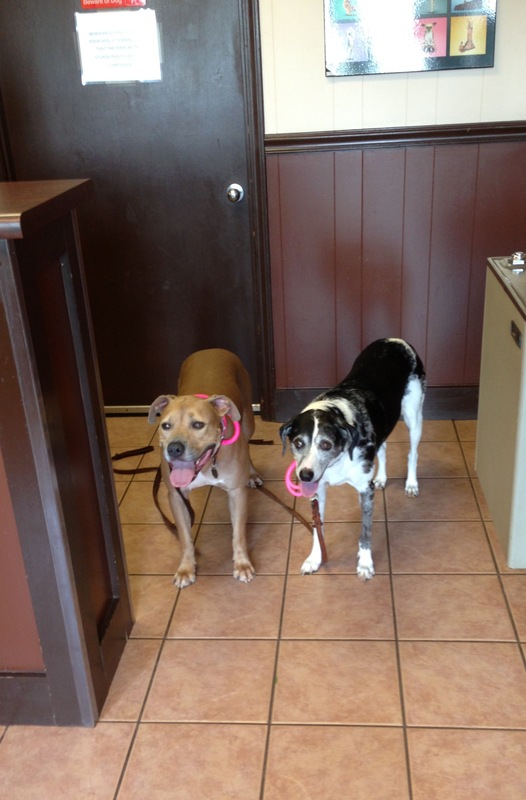 At drop off, we discussed more about Bentley's fears and Angie was already observing him with us right in the lobby. 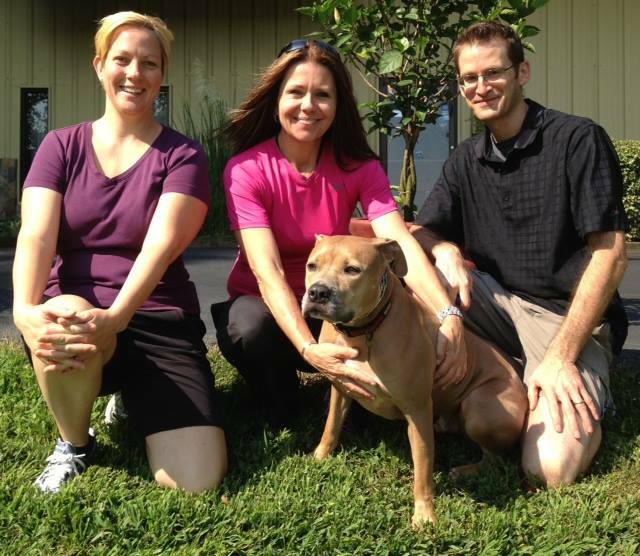 We learned what all was involved and what our role would be, and then we handed over our scared pooch to her. During the week we got updates and saw pictures of him with other dogs, but this pack was different. They were calm and comforting and displayed proper behavior...it was a balanced pack, just what Bentley needed, balance, boundaries, and structured interactive fun within a pack. 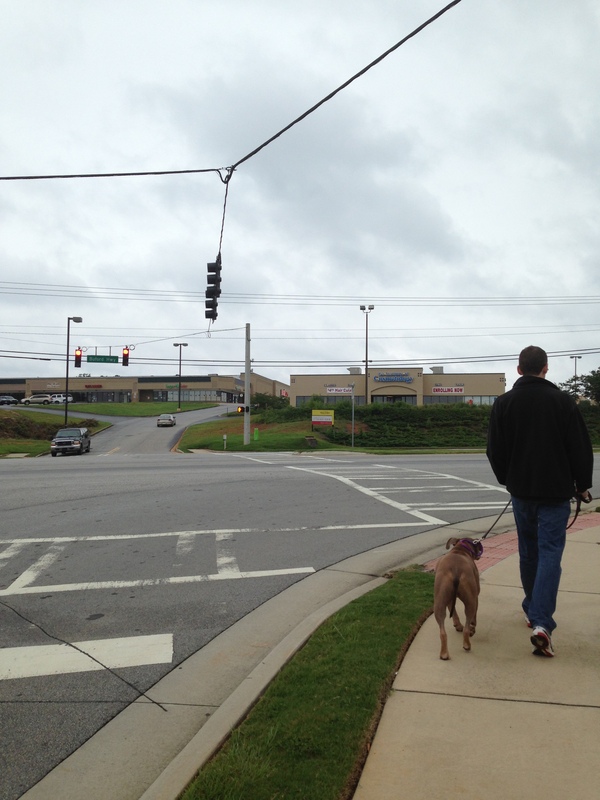 A week later, we excitedly returned and were informed that WE would be walking Bentley with Josh on...wait for it... BUFORD HIGHWAY! (Uhh hello, he is afraid of walking in our subdivision…) But off we went, with a new collar in place to help us guide him. After a week of doing this with Josh, Bentley was amazing. We walked him near a busy intersection which was really loud, in shopping plaza parking lots, and a lawn mower repair place that had mowers running, and Bentley was walking just fine! I was tearing up watching my husband walk our dog happily for the first time, but Bentley was fine! We learned more after the walk and about Angie's observations. Bentley has feral tendencies, which would explain the excellent skill he has for catching opossums! He must have been outside most, if not all the time, before his rescue, maybe with other dogs, but he did not trust humans, and because of that we had to become proper leaders to earn his trust. He stayed one more week, and when we came back, Angie had us bring our other dog to observe them together and to work with her too! We had our first real pleasant family walk...with controlled confidence on our part! We learned other ways of asserting ourselves as leaders, such as keeping our space and creating invisible boundary lines for the dogs to stay behind, which has come in very handy when cooking dinner! Bentley has gone back several times to be with his new pack friends, as has our other dog (who we were told was too aggressive in two other play camps and had no issues here). 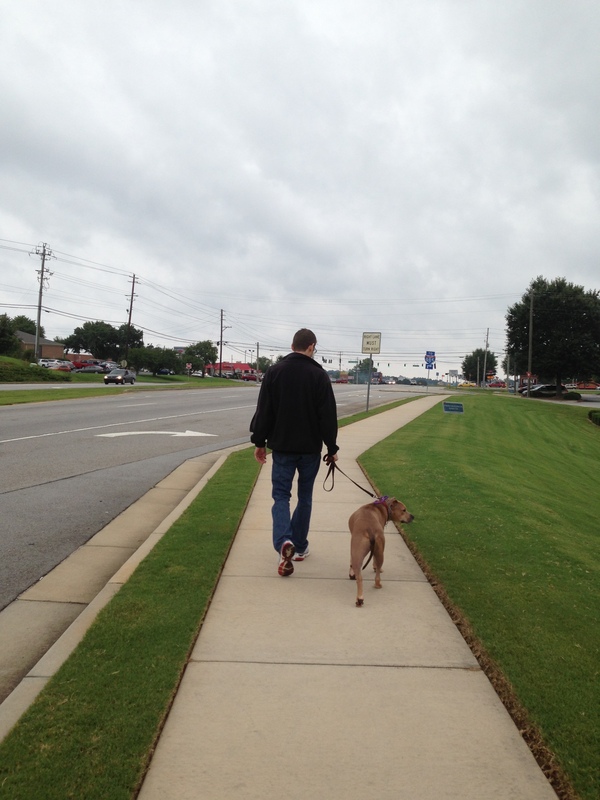 When we were all done, we stopped at Suwanee park where we first met Bentley with his Foster Mom, and as a family took a stroll...even when the fire trucks came blazing out and sirens going...it was magical, Bentley just kept walking! He has also boarded with U.S. Canine when we traveled, and it was the first time since having Bentley that we really enjoyed our vacation, knowing he was not just "boarding" but continuing on his journey of transformation with the staff and his new pack. It was great to know he was outside, getting walks, and to see his picture on Facebook! Bentley still has a lot of growth and potential ahead, but now we have help and are equipped. Angie and Josh are just an email or call away, such as recently when I emailed a video of some anxious behavior and Angie called me and explained how to help him pass it. That is what is awesome, after the full immersion, the relationship with U.S. Canine did not end, and therefore neither does Bentley's journey of healing and growing. Things at home are different now, so much more peaceful and less anxious. We know how to walk Bentley and the best part is he WANTS to walk and comes when we get his collar instead of having to chase him down for a forced walk! My husband and I also know how to be good pack leaders. We are still learning, but even this early on we see huge changes. We can't thank everyone at U.S. Canine enough for all they have done and for what we know they will keep doing!